In a first, the AAD interceptor successfully sought out and destroyed its target amid multiple electronically simulated dummy warheads used as decoys. On August 2, the Defense Research Development Organization (DRDO), the Indian Ministry of Defense’s (MoD) research and development wing, conducted a successful test of its indigenously designed and built Advanced Air Defense (AAD)/ Ashvin Advanced Defense interceptor missile from Abdul Kalam Island, home to the Indian military’s principle missile test facility, the Integrated Test Range, off the coast of Odisha in the Bay of Bengal. The AAD missile, a hit-to-kill interceptor, successfully destroyed an incoming medium-range ballistic missile target amid multiple electronically simulated dummy warheads used as decoys. It was the first time that the AAD was tested against multiple targets, and it constitutes a major milestone in India’s quest to develop a homegrown ballistic missile defense system. It appears that this was the first successful live fire test of a new indigenous imaging infrared (IIR) seeker, developed by DRDO, to distinguish between incoming warheads and decoys. The single stage solid rocket-propelled AAD/Ashin interceptor missile is part of India’s planned two-layered ballistic missile defense (BMD) system and is designed to shoot down incoming enemy missiles in the endo-atmosphere at altitudes of 20-40 kilometers. [15-25 kilometers, according to the Indian minister of defense] AAD missiles are terminal phase interceptors capable of intercepting missiles after they re-enter the earth’s atmosphere. Following the end of the Kargil War and in reaction to China and Pakistan’s growing missile arsenals, India has been working since 1999 on a two-tiered ballistic missile defense system with the PAD [Prithvi Air Defense (PAD)/Pradyumna Ballistic Missile Interceptor] and PDV [Prithvi Defense Vehicle] designed to destroy missiles at exo-atmospheric altitudes of 50–150 kilometers (some sources say 180 kilometers). Both PAD and PDV are designed for mid-course interception in other words intercepting the incoming ballistic missile in space after the rocket burns out. 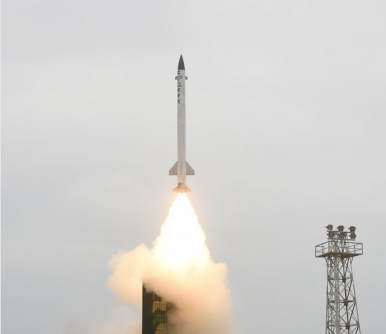 AAD constitutes the second-tier defense against ballistic missile threats. India is in the process of supplementing its indigenous BMD shield with an additional weapon system to bolster air defenses over New Delhi: the upgraded version of the Kongsberg Defense & Aerospace/Raytheon National Advanced Surface-to-Air Missile System (NASAMS), designated NASAM-II. Acquisition costs are estimated at around $1 billion. This was the third successful test of India’s indigenously built and designed anti-ballistic missile in 2017.